makeup. beauty. lifestyle: July Payday Haul/ product review!! After a long and very poor month, payday finally arrived so I thought I'd treat myself to a few things. I thought I'd try the new products out before making this post so I could also let you guys know what I think about them. 1. Urban Decay De-slick Setting Spray - I have super oily skin so I've been searching for a product to control my oil as there is nothing worse than spending ages on your makeup only to look super shiny 3 hours later. I decided to try the travel size of the setting spray to see how it worked for my skin and I picked this up from the Urban Decay counter in Debenhams for £9. However I don't think I'll be purchasing the full size version of this product as it didn't do anything to extend the longevity of my makeup and I would not recommend it to all the oily girls out there. 2. Kiss Ritzy Lashes - These are my favourite lashes, they're glam yet they look natural and I reach for them for most of my neutral/ everyday looks. I needed to repurchase these so I picked up a two pack for just over £7 from Boots which I think is a really good price for 2 sets of lashes. 1. Gorilla Snot Hair Gel - As my natural hair transition has progressed, I have found it harder and harder to get my hair slick which is a look I love. This gel works really well to do so, even better than Olive Oil Eco Styler Gel and I would definitely recommend it as it only costs £3.99. 2. 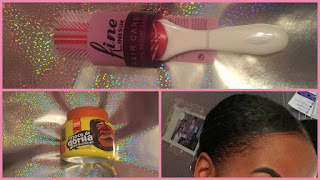 Bootleg Denman Brush - I've seen a lot of natural hair bloggers talking about Denman Brushes and how good they are for natural hair, so I really wanted to try one out for myself. However, I refused to pay £8-£10 for a hair brush. So when I saw this brush that looked very similar in the Afro hair shop I had to try it as it is a fraction of the price at £2.99. This brush is very effective at detangling, however I would not recommend it for very damaged hair as it could worsen breakage. 1. 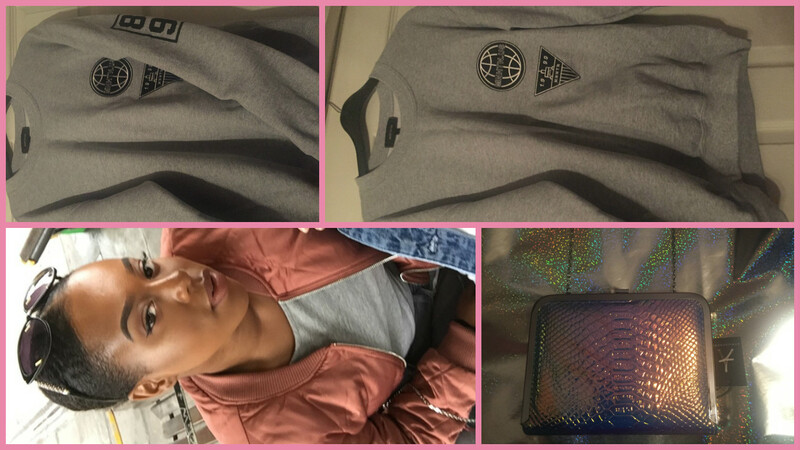 River Island Sweatshirt - As Autumn/Winter clothing is finally hitting the shelves, a few pieces have caught my eye. The first being this grey sweatshirt with badges on the arm from River Island's men collection. I really liked this sweatshirt as I got army/ military vibes from it and I really like the oversized fit. I got this for £26.99. 2. Quilted Bomber Jacket - When I first saw this bomber jacket my boyfriend tried to convince me that I don't need it and so I left it. But when I got home I instantly regretted the decision and so I had to go back and get this beauty. This jacket cost £18 from Primark and although I don't typically like quilted bombers I absolutely loved the colour of this one so I had to get it!! 3. Holographic Clutch Bag - Last but not least is this pretty holographic clutch with a chain strap from Primark. I think this bag would be perfect for a night out or even in the day time when you're trying to go for a more glam look. This bag was only £10 which I think is a bargain. That concludes my payday haul/ review, thank you so much for reading! !